I won't bore you with too many details - though I'm tempted to. I could go on and on about laptops. The important thing though is to say I have a new one. There! Self restraint! Given that the only thing I want to talk about is adventures with laptops . . . I'm finding it hard to say anything useful or interesting about plants. My old one started making fizzing electrical noises. It was quite sca . . . no! Here are some bluebells. English or hybrid or . . . ( ? ? ? ?) - yellow pollen, drooping heads, curled up edges. 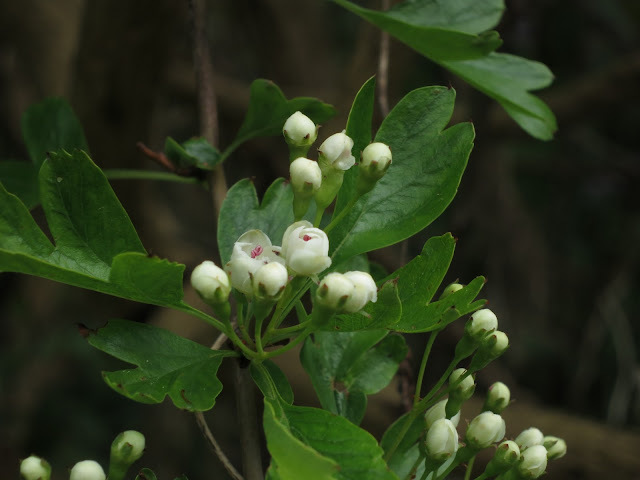 The Plantlife site has information about how to tell them from Spanish ones. And beside them are hawthorn trees. The flower buds are pretty but once they've opened they get bashed around by rain which comes in sharp bursts then goes. Being at last able to use a laptop (. . . why do they sell ones so shoddy one has to take them back to the sh . . . NO!) . . . having a laptop means there's been a point to carrying my camera again so I've been pottering around without a theme; simply re-visiting old places to see what's going on and where. Remember the sycamore in a drain? It's still there! 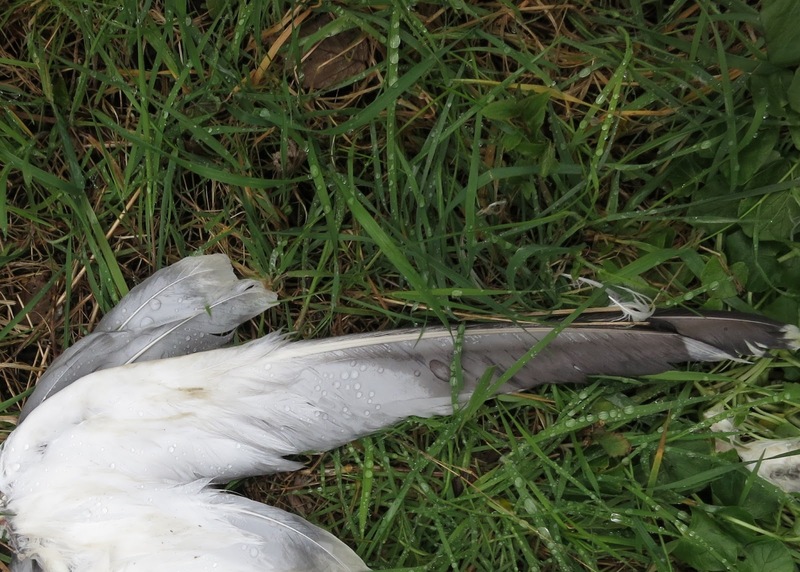 In a minute, I'm going to show you part of a dead gull and a clear photo of some of its insides. In the meantime . 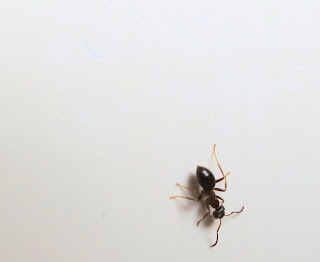 . . here's an ant on a front door. The gull was on the grassy bank beside the bluebells and hawthorn trees. Its head was missing, its guts exposed and its entrails stretched straight. I'm sparing you somewhat. This is only part of the picture - but it was an interesting opportunity. When I found a dead goose on a beach I was able to photograph it in detail and I would have liked to do the same with this bird but instead of the trees protecting me from a new onset of rain, the onset of rain was knocking drops from an earlier shower onto my camera. So I beat a retreat. I photographed this first. I don't know what body part it is. Do you? I've never seen the inside of a gull before! And a few footsteps further - more bluebells. It's good to be back, it's good to be back, hello! hello! 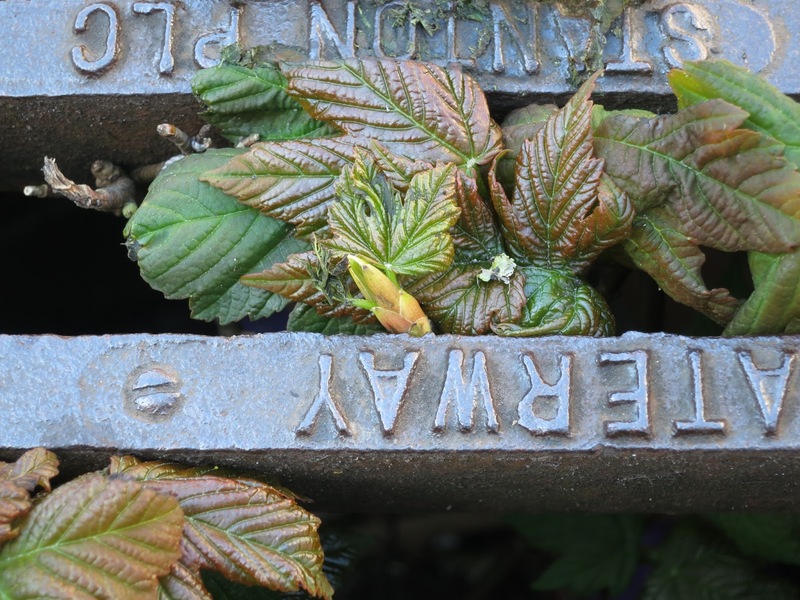 We go way back with the sycamore in the drain. Click here and you'll see it in April and May 2012. Hello Duxbury Ramblers. I'm pleased about your comment. I'd tended (on previous years) to think these bluebells are not native; partly because they are bulky and partly because of their location (wild but on disturbed ground). But when I looked at the I.D. notes I decided I must be wrong . . . I've now put a load of question marks into the text. I've mixed feelings about the bluebell debate because all look good in one way or another. I used to think I didn't like the white kind but now realise that's because I was prejudiced against them rather than judging them on looks alone. And the white ones don't seem (don't seem here, at any rate!) to spread much. Not far away there are vast spreads of what I assume are native bluebells (partly because of the type of woodland they are in and partly because of how much ground they cover which makes them seem very long established) but . . . well . . . ! It was taken over by the National Trust last year. If they are not native, perhaps they will dig them out? Don't know! The ones in the photos are a bit lumpy from a distance but very pretty close to because of the curls on the ends of their bells. These bluebells, or some just like them grow around here, half way around the world, too. 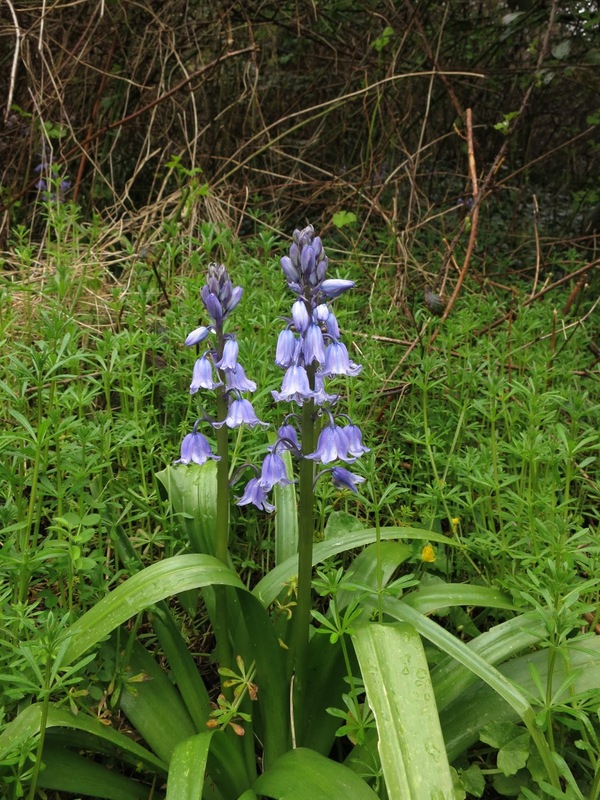 I was taught that native Bluebells have the flowers on only one side of the stem whereas the Spanish variety haave them all around the stem. I didn't think that your 'innards' shot was very disturbing at all, well done for taking it. It is good to see you back again. Hello Susannah. That' interesting. I would guess whichever kind you have they will have been introduced at some point. How one feels about non-native plants . . . our diet in Europe would be dreary if tomatoes and potatoes had not been introduced from the Americas. Hello Toffee Apple. Agree about the one-sided-ness. I passed this area this morning and noticed some are one sided and some have wide leaves and some narrow - so I suppose hybrid wins? Nice to see the Bluebells, think we have a mix of them round here, even white and pink flowers. Will have to take a closer look. Lucy, I'm so glad you have a new computer, have a reason to use your camera again, and are blogging. I always enjoy your posts. But also ... I've been a slacker in terms of street plants, maybe you've noticed. the turn out was so small both times that it was easy to blow it off. Do you want to take it back? I think you have a better eye and mind for the subject. Hello Barbara. I hope you've recovered from the gruesome bit. Interesting how different ones of us react. It's such a rare opportunity (and a privilege) to examine the insides of things. Whether I take photos of them depends on how I feel at the time and how many people are around who might wonder what on earth I'm doing. (Sometimes my nerve holds out better than at others.) Then I have to work out whether readers of Loose and Leafy will be interested too. Balancing acts all around! Hollis - I would love to take the street plants back if that really is ok with you. It's a topic which truly fascinates me. I wouldn't have asked . . . but my heart gave a little leap when I read your comment. So, yes please! Sorry for all the problems with the old laptop. Technology is so nice - when it works!!!!! I have been there!!! The bluebells are nice looking. At this time over here on this side of the Big Pond - Atlantic- my Scilla and Puschkinia and Crocus are blooming. Need more warmth to get the other "lovelies" to show their stuff. Lucy, it's good to have you back with new computer. I have what I call English bluebells in my back garden because they remind me of the woods at home in springtime. They probably aren't "English" at all but I'll not be dissuaded. Poor gull. 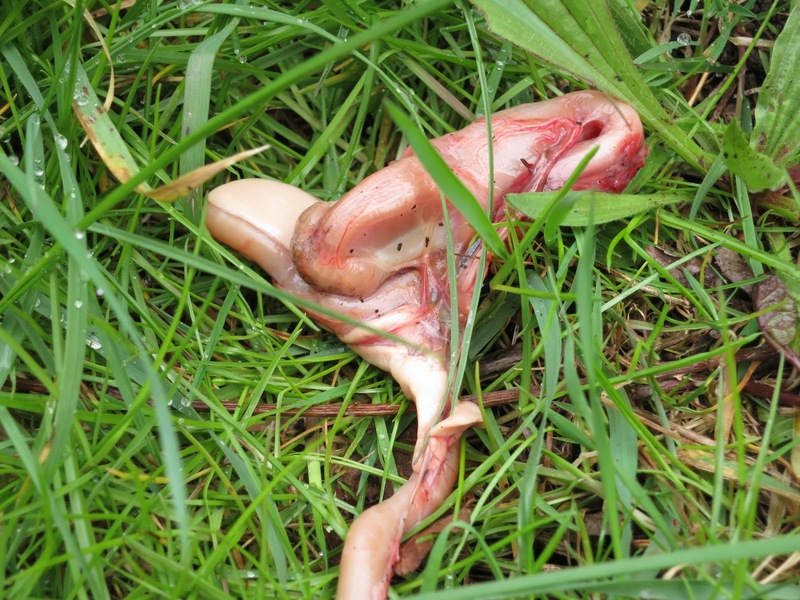 The gull innards looked interesting - but I suppose nothing worse than you get in chicken giblets! 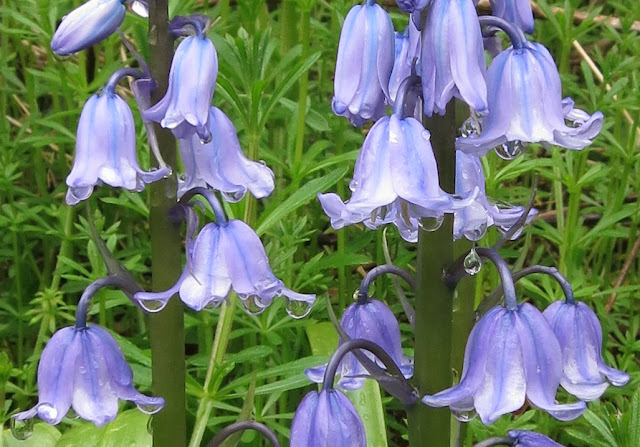 I have given up on identifying bluebells, as I have seen so many variations that I assume they are all hybrids. Your pictures are pretty, though. I am so glad you are back Lucy!